A dazzling flash of light fills the sky over southwestern Wisconsin when what is believed to be a meteorite burst around 10:07 p.m. on April 14, 2010, illuminating clouds and contrails from airplanes. Full Story. A small chunk of rock believed to be a fragment from ameteor that burst into a stunning fireball over Wisconsin Wednesday night wasdiscovered by a farmer after it fell on the roof of his shed. The meteor fragment is peppered with gray, white and reddishminerals, though one side is covered in what scientists called a "fusioncrust" ? a layer of dark material forged during the meteor's fiery passageinto Earth's atmosphere. It weighs just 0.2 ounces (7.5 grams) and is about 2inches (5 cm) long and less than an inch wide. 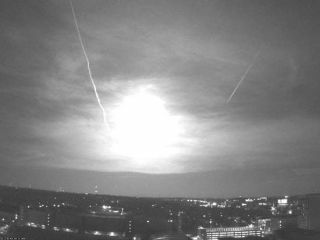 A camera mounted to a campus building at the Universityof Wisconsin-Madison caught the Wisconsinmeteor's explosive demise. The meteor's sonic boom and explosion were alsoseen and heard by numerous witnesses, and sparked frantic 911 emergency callsacross six different states, according to the Near-Earth Object Office at NASA'sJet Propulsion Laboratory (JPL) in Pasadena, Calif. When the meteor exploded, it unleashed as much energy asthe detonation of 20 tons of TNT, NASA scientists said. Their analysis foundthat the parent meteor was about 3.3 feet (1 meter) wide before it blew apart. The first reported piece of the space rock was discovered by a Wisconsin farmerThursday morning and brought to the University of Wisconsin-Madison for analysis. The space rock was not associated with the GammaVirginids meteor shower, which was under way at the time. Instead, it mostlikely came from the asteroid belt, NASA scientists said. Scientists at the geosciences department of theUniversity of Wisconsin-Madison studied the meteor fragment briefly using ascanning electron microscope and an X-ray spectrometer. The rock includestraces of magnesium, iron and silica compounds, as well as other commonminerals like olivine and pyroxene. The meteor fragment also contained iron-nickel metal andiron sulfide, minerals typically found in primitive meteorites discovered onEarth, but scientists hope to see more pieces of the exploded meteor forcomparison. "Until we look at more samples and are able to takesome measurements, we won't know what kind of meteorite it is," saidNorika Kita, a meteorite expert at the university who studied the meteorfragment with colleague Takayuki Ushikubo. Researchers are convinced more fragments exist based onthe first sample's "fusion crust," which is only on one side of therock. "If the meteorite had broken up high in theatmosphere it would have developed a fusion crust that completely covered theexterior," explained geosciences professor John Valley also of the University of Wisconsin-Madison. "Thisdoesn't have that, so it broke up low enough that I'd have to say more of ithit the ground." The discovery of meteor fragments and meteorites known tohave entered Earth's atmosphere over Wisconsin is exceedingly rare, universityofficials said. Only a dozen meteorites have been documented inWisconsin, with shards from seven of them recovered and on display at the Universityof Wisconsin-Madison's Geology Museum. Most of those are more than 50 years old. Objects as big as washing machines typically fallinto Earth's atmosphere on a monthly basis, but most burn up beforereaching the ground. Many of the resulting fireballs are not seen because theyoccur over remote areas or over the ocean. Earth is more than two-thirdsocean. "The frequency of space debris entering ouratmosphere that is large enough to generate a fireball is something on theorder of once or twice a day," said Don Yeomans, manager of the Near-EarthObject Office at JPL. "What is somewhat unique about this one is that itwas witnessed by so many and captured on tape. Sounds like it was spectacular.I wish I had been there to see it, too." University of Wisconsin-Madison officials are asking anyonefinding pieces of the meteorite to bring them to the UW-Madison Geology Museumat 1215 W. Dayton St. in Madison. Meanwhile, avid skywatchers have a chance to see meteors again in the nightsky. The Lyrid meteorshower should be visible to observers on clear nights between April 16 andApril 22. Anywhere from 10 to 20 meteors an hour could be seen,according SPACE.com skywatching columnist Joe Rao. ?